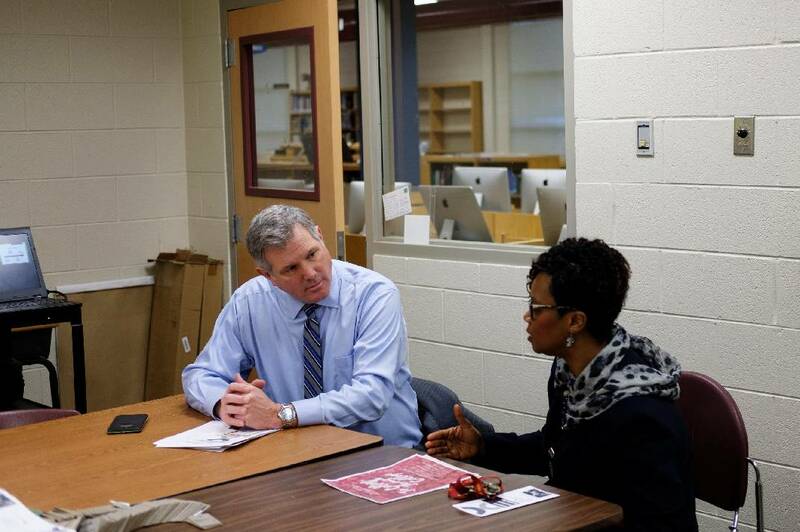 Principal LeAndrea Ware, right, speaks with Geoff Ramsey in an office as he shadows her for the morning at Howard School on Wednesday, Jan. 23, 2019, in Chattanooga, Tenn. Ramsey, the 2018 president of the Greater Chattanooga Association of Realtors, was one of 18 Hamilton County Schools' Leadership HCS participants who shadowed principals at schools across the county Wednesday. Community members got a taste Wednesday of what it's like to run a school in Hamilton County. A total of 17 members of Leadership Hamilton County Schools got to be a "Principal for a Day" at local schools. Business owners, real estate agents, elected officials and heads of local nonprofits began their days across the county in an effort to get to know and understand the schools in their communities. Geoff Ramsey, president of Greater Chattanooga Realtors, met Principal LeAndrea Ware while it was still dark at The Howard School in downtown Chattanooga. Shouting "good morning, have a great day" to students, holding doors open and waving at passersby, Ware introduced Ramsey to a variety of community members and school leaders before taking him on a whirlwind of a day. Ramsey followed Ware through the hallways of one of Hamilton County's highest-needs schools, visiting classrooms like the school's construction workshop, health care simulation lab and Newcomer Academy. He watched her field emergency phone calls, praise students or hurry them along, and go about the business of running a school. "She's got a lot of energy, that's for sure," Ramsey said. "I am amazed about how much more than just teaching is involved in running a school. There are a lot of hurdles over here." The program, Leadership HCS, was launched last fall by the district. Modeled after programs like Leadership Chattanooga, its purpose is to to create opportunities for community stakeholders to experience Hamilton County Schools, and in a way for the district to gain allies and friends. Some of the participants, like Ramsey, who does not have children of his own, knew little about what went on behind the walls of certain schools. Many were surprised by what they saw. "I think people across the board underestimate the amount of work it is overall," said Chris BespalecDavis, manager of school and teacher programs at the Hunter Museum of American Art. She shadowed Debbie Smith, principal at the Center for Creative Arts. "The students and what they bring with them, the teachers and the work that they do there is never a moment that something isn't happening." Josh Sneideman, vice president of Thinking Media, said being a principal was a "thankless job." "It was amazing, everything that they had going on over there," he said of his visit to Normal Park Museum Magnet School. Principal Carrie Willmore and Sneideman visited classrooms, met with the school counselor, as well as the school's parent-teacher association, known as Spark. "The biggest surprise was that we hear the education happens in silos, so it was inspiring to see teachers from different disciplines planning together. I learned a lot about leadership." Ramsey said he did not know a lot about Howard before he spent the day there, but the things he had heard weren't very good. City Councilwoman Demetrus Coonrod of District 9 said she wasn't that surprised by what she saw though. An alumna of Barger Academy herself, Coonrod visited Clifton Hills Elementary, shadowing Principal Lindsay Starnes. "It was sort of expected," Coonrod said. "I feel like they need here a lot of resources at the school. I couldn't help but think about the Chattanooga 2.0 report that told us our kids are failing, our schools are failing." Another elected official — one who holds the district's purse strings — County Commission Chairwoman Sabrena Smedley, of District 7, spent her morning at Chattanooga School for Arts and Sciences. She also mentioned funding, though while praising CSAS Principal Jim Boles. "A lot of the teachers I met are former students of CSAS, so it's really a big family there," she said. "And they had very good things [to say] about their principal. He's doing a great job. He needs a raise." Ware said it is important to bring outside community members into schools to see the day-to-day experience of what it's like. "It's so insightful for people to come in and really get an intentional understanding of what is going on here," she said. "This is really an eye-opening experience for many people."